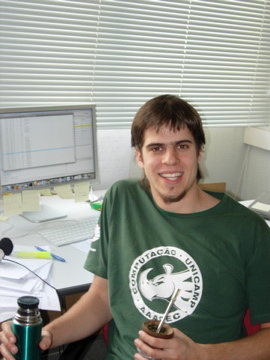 I succesfully defended my thesis in Februrary 2011, and I am doing now a postdoc at XRCE with the MLDAT team. This page will probably become increasingly out-of-date. I look what context-free grammars can tell us about DNA sequences. Specifically, I infer straight-line grammars to represent such sequences and see what they reveal on the underlying structure. In our latest work we focus on the Smallest Grammar Problem, and we split the problem of searching for such grammars into two. This permits us to define a search space, and we define algorithms that traverse it. We improve state-of-the-art approximation algorithms for the Smallest Grammar Problem: our experiments reveal that not only the grammars we found are smaller, but that the structures they unveil are dramatically different. We propose an algorithm to update a suffix array while replacing some of the occurrences of a word in the indexed text. This permits to accelerate SLG algorithms. More details and a some experiments can be found here. Straight-line grammars have been used for compressing sequences in a framework called Grammar Based Codes. I extended this concept beyond context-freeness and have some promising results on compression of DNA sequences. International Journal of Foundations of Computer Science 20-6. pages 1025-1045. Dagstuhl Seminar Proceedings: "Structure Discovery in Biology: Motifs, Networks & Phylogenies"
In Proceedings of the 4th International Conference on Language and Automata Theory and Applications. pages 154-165. If you want some really efficient software to calculate exact repetas, maximal, largest maximal or irreducible rigid patterns (besides any program used in one of my publications, contact me.